The subject of shutters on mid-century homes has become a contentious debate in the world of MCM home ownership. Many mid-century purists believe that there is no room for shutters on mid-century homes. Many mid-century architectural purists I have surveyed have a slight varying opinion and believe that only functional shutters (or shutters that appear functional) have a place on any home. I myself am an architect and I have my own differing opinion. Let me tell you why. Fast forward to the 20th century. Exterior shutters were sometimes still used to control ventilation, but as the year’s progressed, even this function became supplanted by electricity, fans, and air conditioning. What of the lowly shutter? It became, as interior shutters became, a decorative element to dress up your home. If you look back at mid-century plan books, you’ll see decorative shutters on many a house. Will you find shutters on high-style modern homes such as Eichlers? No. But you will find them on more modest houses of the mid-century period. 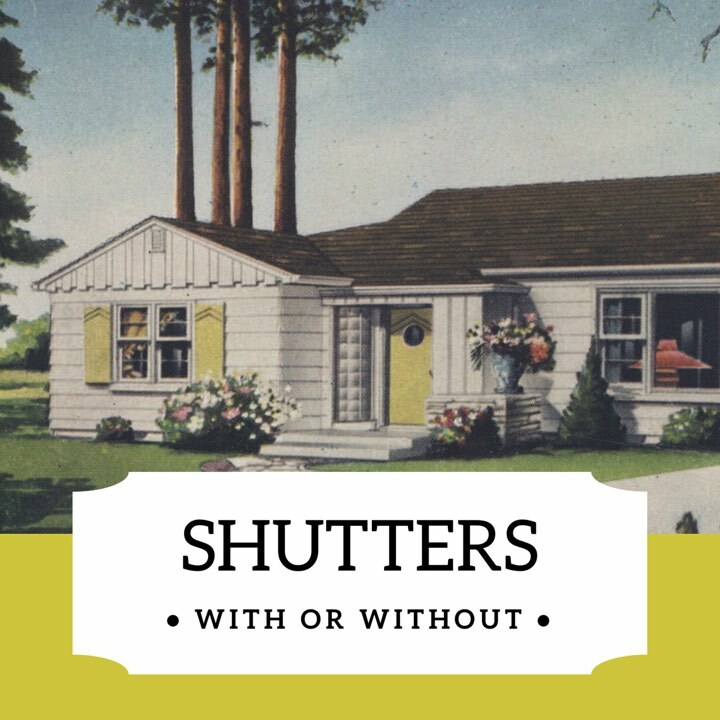 So, how do you use shutters on a mid-century home? Stick with shutters that convey the style of your home. If your shutters are to be decorative, they should make a statement about your house and accent the architecture. Think about a design for your shutters that is in tune with the design of your front or garage doors. Consider proportions. Your shutters should be half the width of the window. Try not to use shutters on picture windows. Even though there are vintage house plans showing just that, it’s more of a don’t than a do. Do your own research. Look at old house plans and tour your neighborhood to look for houses that have shutters done right. Last, don’t run to the nearest big-box for shutters. Chances are they won’t have a style that befits your mid-century home.